I left Rapid City yesterday afternoon with clear skies, warm winds, and dry roads. And my thermos full of coffee. The only reason I had a winter coat with me was because I forgot to take it out of my truck the last time, along with my snow boots and wool hat. My route puts me through four passes between Rapid City and Butte with all four passes in Montana. Earlier in the day, my sister messaged me to say that the winds going through Livingston were so bad the interstate was closed and traffic diverted through town. By the time I arrived the winds subsided to a manageable grapple. Eight hours into my drive rain started falling and the caravan of traffic along I90 W slowed from 80 to 75, then 65, finally 45 miles per hour. We climbed Homestake pass one after another making our way through rain mixed with snow. 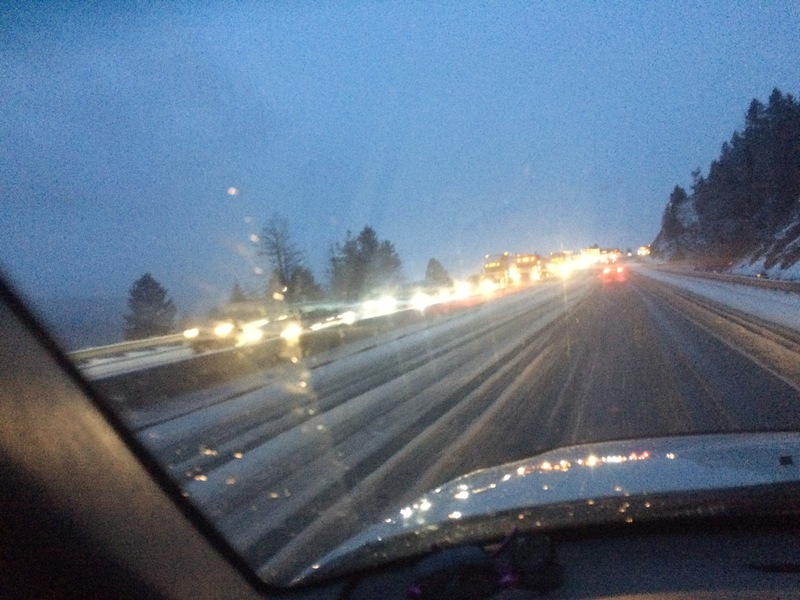 Three hours earlier, outside of Billings hail slowed interstate traffic where I saw one vehicle on its side in the ditch. Two highway patrol vehicles were there so I did not stop. Just before the rain really started, I shut off my cruise control and left it off for the duration of the trip. Leaving it on, even if the driver taps the brakes to disengage it temporarily, risks having cruise control engage when the vehicle hydroplanes on a wet road thus adding considerable speed to an out of control vehicle. All this I thought about while climbing up Homestake pass and I hit the cruise control off button several times, just to be sure. And turned off my audiobook. The top of Homestake Pass crosses the Continental Divide at just over 6300 feet. By now, the snow wasn’t just coming down – it came in sideways and frontways. The caravan’s speed suddenly dropped to 5 miles per hour. I no more than got into the left lane when I entirely lost control of my pickup. My speed wasn’t more than 7 or 8 mph, but that didn’t change the fact that I careened wildly toward the concrete divider (missing it by 0.0095 inches) and then sideways into the car in front of me (meaning I would have t-boned my own truck). And without hitting anything, my truck stopped. Very sheepishly I steered back into the right-hand lane and proceeded 5 mph through the pass and down most of the mountain. Over the past 20 years, I’ve logged at least half a million miles on the road. I’ve driven in every conceivable weather condition from Montana to Texas, North Carolina to Oregon. I know better than to drive with impatience. I know the treachery of spring snowstorms in Montana. I know Grace when I receive it.